Key Difference: Frogs have a moist, wet, smooth and shiny skin. Toads have thick, rough, dry and leathery skin with little wart like bumps. Frogs and toads are difficult to tell apart only on the basis of looks, as they seem very similar. These two amphibians are well-known and even used culturally in many stories or as an ingredient in witches’ spells. It often takes a keen eye and basic knowledge in order to tell them apart. For people who are not so involved in nature, it is often confusing to tell them apart, especially with the various myths going around about toads giving people warts. Let’s try and differentiate them in layman’s terms. 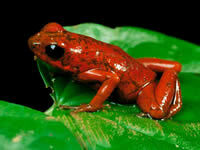 Frogs are a part of the Animalia kingdom and Anura order. The species are often classified among 33 different families, of which the largest ones are Leptodactylidae, Hylidae and Ranidae. The term ‘frog’ has been derived from the Old English word ‘frogga’, which is probably adapted from Proto-Indo-European ‘preu’ = "to jump". Almost all of the species in the Anura are considered as frogs, while only members of the family Bufonidae are considered as "true toads". Frogs are considered as aquatic or semi-aquatic creatures depending on their species and must reside somewhere near water or in water in order to survive. They are found in almost every continent except for Antarctica. The easiest way to distinguish a frog is from the look of their skin. The skin of a frog is moist, wet, smooth and shiny. Many species of frogs secrete smooth, sticky layer of toxic substance in order to keep their body moist and to keep predators away, though there are many animals that are unaffected by this substance. Frogs are often small, have a skinny body with a narrow waist and do not have a tail. They have powerful hind legs, which are slightly longer than their fore legs and have protruding eyes. Their back feet are webbed in order to help them climb surfaces and swim in water. Many frog species also have a full set of small teeth, though some species only a bottom set of teeth. Frogs can range in many colors from green, yellow to brown in order to help them camouflage against predators. The lifespan of a frog can last from 2-15 years in the wild and up to 40 years in captivity. 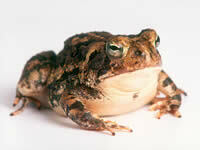 Toads are also a part of the Animalia kingdom and Anura order. These species are often classified among Bufonidae, Bombinatoridae, Discoglossidae, Pelobatidae, Rhinophrynidae, Scaphiopodidae, and Microhylidae families. Only the toads in the Bufonidae family are considered as true toads. The most common toad is the English toad also known as the Bufo toad. Scientifically, there is not distinction made between frogs and toads in taxonomy. Unlike frogs, toads do not require water in order to survive; they can also survive in dry and arid areas. However, they will adapt to moist and areas closer to water with ease. Toads are found in almost all continents except Antarctica and Australia. Toads are often known for their warty skin. The skin of a toad is thick, rough, dry and leathery. It also has small bumps on it that make it seem like it has tiny warts. They are distinguished with a chubby body and small stubby legs. Toads have separate tows on their hind and fronts feet. They also do not have a tail. They have large eyes that have ridges on it and behind these eyes are the paratoid glands. These glands are responsible for secreting a sticky fluid that is smelly and poisonous in nature in order to keep the predators away. They also play dead by inflating their bodies to fool their predators. Also while frogs use their powerful hind legs to jump, toads are more known for hopping instead of leaping. Toads do not have any teeth. The toads are usually found in dark and dirty colors and can easily blend with rocks, longs and leaf litter. The lifespan of a toad can range from 2-20 years in captivity and 5-10 years in the wild. Though, many toads have also lived to the age of 40. Frogs are spread across 33 families of which the largest families are Leptodactylidae, Hylidae and Ranidae. Toads are spread across Bufonidae, Bombinatoridae, Discoglossidae, Pelobatidae, Rhinophrynidae, Scaphiopodidae, and Microhylidae families. Toads of the Bufonidae family are considered as true toads. Frogs usually have a smooth, shiny, glossy and moist skin. Toads usually have a dry and rough skin. Frogs have long and powerful hind legs. Toads have small and stubby hind legs. Frogs have webbed feet, more commonly the back feet. Toads have small separate toes. Female frogs produce eggs in small or large clumps on the surface of water. Female toads produce eggs in a long chain on the surface of water. Some toad species bear live young. Some female toads produce poisonous eggs in order to minimize predators. The frog larva resides in water and has gills in order to help it breath. It does not surface until it reaches a certain maturity. The toad larva resides in water and has gills to help it breath. It only surfaces after it reaches a certain maturity. Small, skinny body with a narrow waist, webbed toes, protruding eyes, and the absence of tail. Chubby body, with small stubby legs. The toes are seperate. The skin is dry and bumpy in texture. No tail. Has a row of small teeth along the top and bottom of its mouth. Requires a wet habitat with water close by in order to survive. Does not require water in order to survive. Can survive in dry, arid climates. Eyes do not bulge out and are large. The eyes are defined by a ridge above it. The gland that secrets poison is behind the ears. Using their long and powerful hind legs, frogs jump high to escape their predators. Toads excrete smelly and poisonous slime that keeps the predators away. 2-20 years in captivity, their lifespan has not been monitored in the wild. 2-20 years in captivity, 5-10 years in the wild. snakes, lizards, birds, hedgehogs, fishes and water shrews. Snakes, owls, skunks and raccoons.